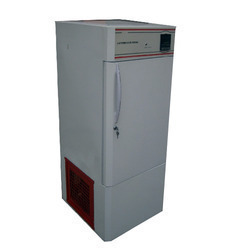 Our Low Temperature Freezers are in conformity with all requirements of industry for economic way to create Temperature below freezing point to suit various standards application in the field of, science & research for storage & testing in biology, anatomy, chemistry & in many other fields, for industry & science. Digital display Electronic Temperature controller / P.I.D Controller. Inner Chamber: Made of stainless steel 304 quality duly polished. The working chamber is completely free for use. Outer Chamber: The outer housing is made of galvanized steel sheet powder coated or completes Stainless Steel. Cooling Coil: Cooling element is embedded from outer side of the working chamber. Condenser Coil: The Heat Exchanger coil is air-cooled condenser, arranged on right / bottom in Equipment. Door: Double Door system with Inner Glass door to avoid temperature loss. Caster: Two fixed & two swiveling. Looking for Temperature Freezers ?